Bhubaneswar is the capital city of Odisha. It is well connected by air, rail and road ways to different parts of India. The ancient city of Bhubaneswar is popularly known as the City of Temples. Besides the famous Lingaraj temple, there are many more ancient temples in and around the city. Most of these temples depict the ancient Odishan temple architecture. 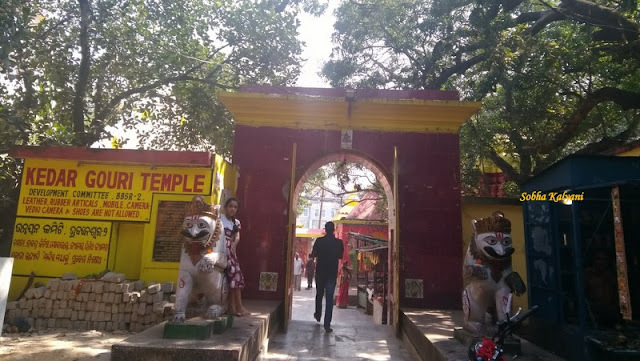 Kedar Gauri temple is one such ancient temple located adjacent to Mukteswar temple. This is a small temple complex with the typical Odisha style 'Simha Dwara' i.e. main entrance gate. From here we walked to Kedar Gauri temple. This temple too is not much crowded. Like most of the Odishan temples, you can see huge statues of lions at the entrance. As you enter inside, the white painted temple to your left is the temple of Kedareswara. While the orange / yellow painted temple to your right is the Gauri Devi temple. There is also a temple of Hanuman inside the presides. After spending some time in this old temples, we felt energized and were back to our hotel room. Mukteswar temple, which is a 10th century C.E (Current Era) temple, is one of the must-see places in the capital city of Bhubaneswar.